Pineapple salsa and jack cheese take you out of the ordinary, just like a well-deserved vacation! For the pineapple salsa, mix the pineapple, green pepper, onion and cilantro. Add lime juice and salt to taste, and toss mixture. Set aside. Mix ground beef, salt, black pepper, and onion powder thoroughly and form mixture into 4 equal oblong patties (in the shape of the Garlic Texas Toast, as this will serve as your bun). Set aside. Heat grill to a medium temperature. Grill burger patties for 5-7 minutes on each side until desired doneness (the internal temperature reaches 145°F for a medium burger). Meanwhile, toast or bake garlic bread according to package instructions. 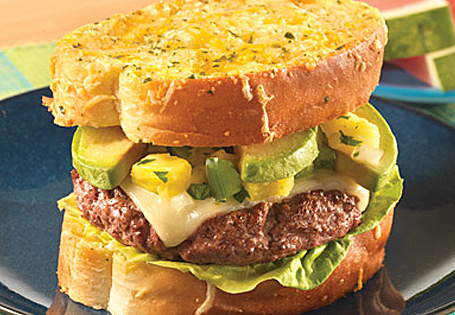 To assemble burger, layer the garlic toast with 1/4 cup butter lettuce leaves, 1 burger patty, 1 slice of Pepper Jack cheese, 1/4 of the pineapple salsa, 1/4 of the avocado slices and top with garlic toast.